Marker pens with intense, beautiful, vibrant colours that you can blend like paint. Every part of this pen, from the carrier system that holds the pigment to the material of the nibs, has been specially engineered. “We’ve conducted extensive research to identify the best nibs to work with a pigmented system; they’re specifically tailored for this kind of pen,” says Lamoureux. Using the Pigment Marker feels somewhat more practicing painting techniques than a traditional marker. The softer nib glides more smoothly over the paper, the colour is slower to dry and it’s blendable – either with a brush or with the White Blender marker that accompanies the range. 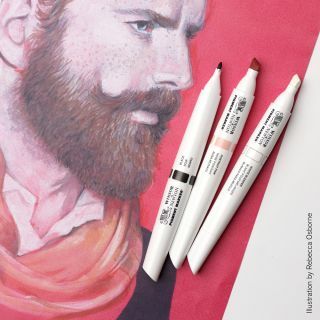 Winsor & Newton source their pigments internationally and have laboratories in the UK, France and China. “We test and evaluate a huge number of pigments and only select the ones that perform best,” says Lamoureux. Pigments are tested for brightness, lightfastness, how clean the colour is, and also chemical stability to ensure that they’re fully stable, not only on the paper or canvas, but also within the marker itself. To determine the lightfastness, an accelerated test is carried out that exposes the colour to intense UV light. This enables Winsor & Newton to guarantee their pigments will remain lightfast for 100 years. The markers are £4.99 each and are available in 100 colours. This article was originally published in Paint & Draw magazine issue 02. Buy it here.